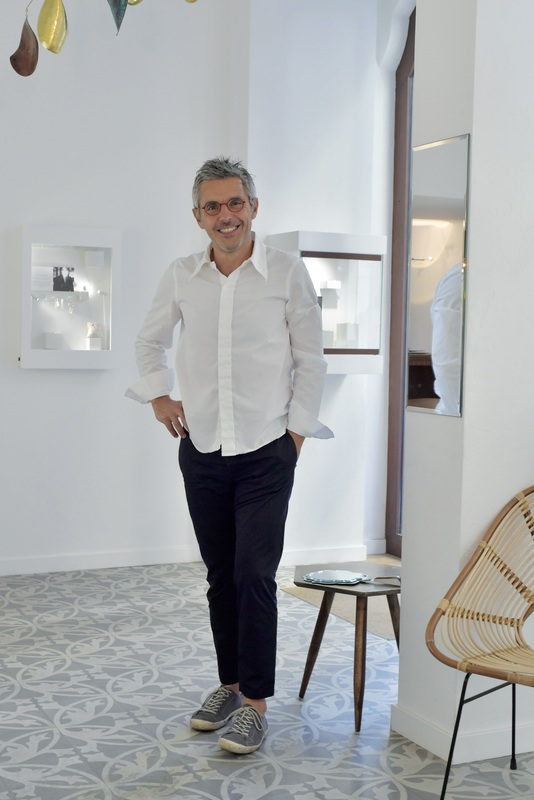 Though he was initially reluctant to enter his family’s jewelry business and only ultimately did so on his own terms, today world-renowned Lebanese jeweler Selim Mouzannar loves his work. In addition to creating his signature, traditionally-inspired designs, he recently opened the jewelry concept store Macle and continues his social activism with the Right to Nonviolence NGO that he co-founded. Glasses, LINDBERG I love glasses but I’m notorious for losing them. I keep pairs everywhere so I always find some. Shirt, Marni I love white shirts and the feeling of good cotton. I think the authority in this is Dries Van Noton but I love Marni too. Where do you sell your jewelry? In Beirut there is the Selim Mouzannar boutique in Achrafieh. I started expanding internationally 10 years ago and now we sell in London, Paris and Geneva in Europe, also New York, Los Angeles and a few other cities in the US, and regionally in Turkey and the UAE. I don’t want to expand too much because I want to stay niche. This is Macle, an experimental jewelry collective that I curate. We have Lebanese and international designers and there’s a champagne bar which makes it a more fun experience. The Selim Mouzannar boutique is across the street and in a few months I’m opening an estate jewelry boutique next door. Pants, Marni Marni is not that well-known for menswear and its menswear is not sold in Lebanon so I buy the brand wherever I find a store. People always tell me my pants are too short – and now that’s the trend – but I’ve been wearing this style since I was a teenager. Trousers are all trousers but there are ways to make them look a little different. Do you dress for comfort or for style? I look for comfortable, conservative and creative clothes. Comfort is more important than looking good and I wear brands that are specialists and understand comfort, technique and good materials. You recently won an award? I received the Couture Design Award 2016 in the Best Colored Gemstones category – this is like the Oscars of jewelry. The necklace that won is made with emeralds and I called it Amal, meaning hope, because green symbolizes hope. It’s a one-off piece and I don’t want to sell it even though people have asked to buy it. Shoes, n.d.c., made by hand These are old and many things I have I’ve owned for many years. I believe in timeless design and it’s something I apply to my designs too. What makes Selim Mouzannar pieces special? We make pieces that are a little different. It’s about creating what you really are, being an individual, having character and an identity. There’s so much copying around us – and at the end of the day I’m one person among seven billion so I can’t create something that’s completely unique; [my designs]definitely resemble something else. But my clients are very wealthy; they can afford to buy the best jewelry in the world but they want something that’s not mainstream.